Moritz Tolxdorff announced on Google+ that the top contributors in the forums are hosting a Google+ hangout to answer questions on Google+. He said, "we are going to host the first TC Help Desk hangout this week." They hope to continue to do this hangout weekly. He added that they are volunteers not being paid by Google. 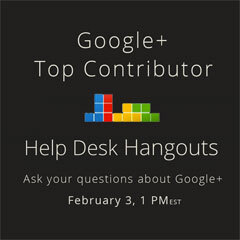 These Hangouts will be exclusively for those who have questions about Google+ Top Contributors from the Google+ Help Forum will be available to answer your questions, and give some advise. We are not working for Google, we are just volunteering in helping others! So if you want in, just go to his Google+ page at around 1pm EDT today. There is a lot more discussion around this topic on John Mueller's page.